Nixon and I hosted an ALL-BOYS play date. We invited 8 little boys, so I knew I needed to have a plan to keep these little guys busy. 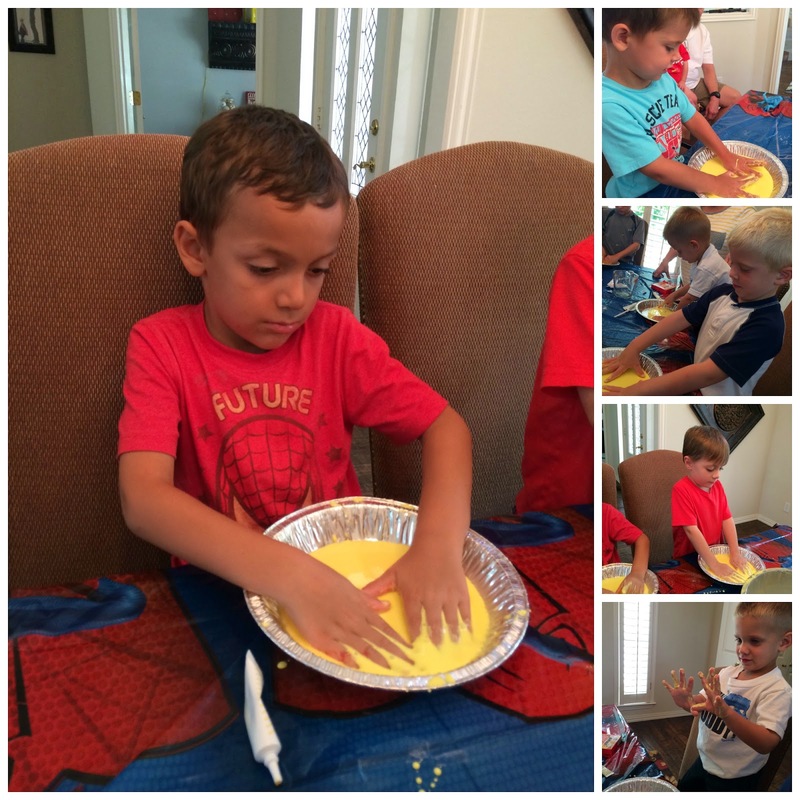 I searched Pinterest for ideas and came up with Science Experiements!! I found a TON of ideas. Nixon was super pumped about getting messy, so I knew with these boys it'd be a hit! The first experiment was called NUMEROUS things on Pinterest. I found TONS of ideas using the exact same things. We called it...Explosions. hahaha! Original, huh?? I placed about a half a cup of vinegar in all the cups. Then I had the boys add the color of their choice. They stirred it up. Then we added a teaspoon or so of the baking soda. Of course, it explodes and overflows (that's why we used the pie pans). Look at Smith's reaction!! hahaha! And...Luke's face is hilarious! Smith looks SO relieved, doesn't he?? hahaha! This probably should have been last! It was SO easy! It was by far their favorite simply because of the "explosion". The next experiment was Oobleck. We did this when I taught third grade and apparently it doesn't matter what age you are...everyone enjoys playing with it. :) When you mix the ingredients together, you get a solid/liquid mixture. If you pat it, it feels like a solid, but if you pick it up, it drips like a liquid?? There is a Dr. Seuss book about this goop that falls from the sky (Bartholomew and the Oobleck). I think that's where this goop gets it's name. You just mix all the ingredients together. If it's a little too solid, add a little more water. Or...if it's too liquidy (that's a word :)), add more corn starch. We had to tweak it a little bit to make it work. But...after mixing it up for a minute, it was PERFECT!!! I gave each of the boys some in their own pie pan and they LOVED it!! I had a tablecloth down, but somehow I had Oobleck ALL over! hahaha! No worries though. It wiped right off the floor and rug! Check out Luke's face?? He's loving it! Others were making a fort in Nixon's bedroom. This one was being WAY too cool! I asked Marla (my mother-in-law) to come over. She's super creative and was a teacher. I knew I could use her help. She was so great! She made the boys line up to go downstairs!! And...she brought Gary as an extra reinforcement! Experiment #3 was the Ivory Soap Clouds. All you need is a bar of Ivory soap, a paper plate, and a microwave. I put the entire bar of soap on the plate and heated it for about 1 minute and 15 seconds. I'm sure there is a super scientific explanation for it, but what happens is the soap expands to look like a cloud! I let the boys mess with it afterwards. It eventually kind of all breaks off into tiny little messy pieces, but they enjoyed it! Thank you, Carter, for being so into it. :) haha! And...our very last experiment was a big flop!!! 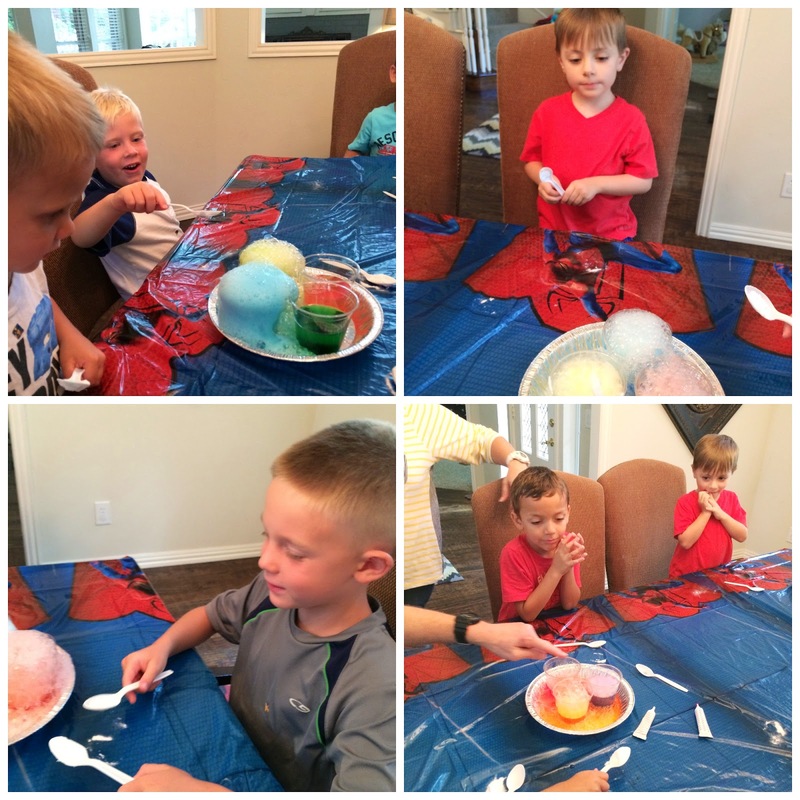 We tried to make homemade bouncy balls with soap, borax, corn starch, and a few other things. It was a BIG mess!!! I scrapped it and decided 3/4 experiments was pretty good! A BIG flop AND Maddox had blue hands! Then we got out blankets and pillows so we could be comfy cozy while we watched part of a movie until their mamas came! The PERFECT boy's play date! Listen, Smith had THE BEST time! He talked about those experiments for days and days. Thanks girl for letting those crazy (and super sweet!) boys spend the day with you!! What a fun mom you are! :) Love the simple science ideas. Also - I love your MIL's shirt! Do you know where it's from? SO FUN friend! Carter had an absolute blast, and the pics of all of them were so cute! Loved the one of Bowen being too cool! What great ideas and just letting boys be boys! They need that time so much. And you have the best MIL! Sounds like lots of FUN!!! Very creative! I'm impressed!! Great ideas for the boys and you could tell they were really into it. You're a brave woman! What fun! Ok now I have to try this! What a fun mama! How much glue did you add for the oobleck? These look SO FUN. Can you tell me about your bunk beds? Where are they from? They look like doubles? Such a fun idea! In grade school my 6th grade science teacher had an "experiment" where we mixed glue and borax together with food coloring...and it made the most fun slime...or silly putty! Now I make this at my school and my son is ten and him and his friends STILL enjoy this! I love all of your ideas...I am going to have to try them all out with my son and my nieces...I love fun moms and their ideas!